Year-round cruises have returned to Lake Mead. Lake Mead Cruises has announced that Midday Sightseeing Cruises will run at 12pm and 2pm daily, every day of the year except Thanksgiving and Christmas. It has been several years since the Desert Princess offered excursions through December and January, and the crew of the three-deck paddlewheeler is excited to stay out on the water through Southern Nevada’s famously mild winters, allowing passengers to enjoy scenic Lake Mead, celebrate special occasions, and treat friends and family to a unique outing on the water no matter the time of year. Champagne Brunch Cruises have also been extended. American-style brunches, accompanied by a champagne greeting, are available every Sunday morning at 10am, February through November. 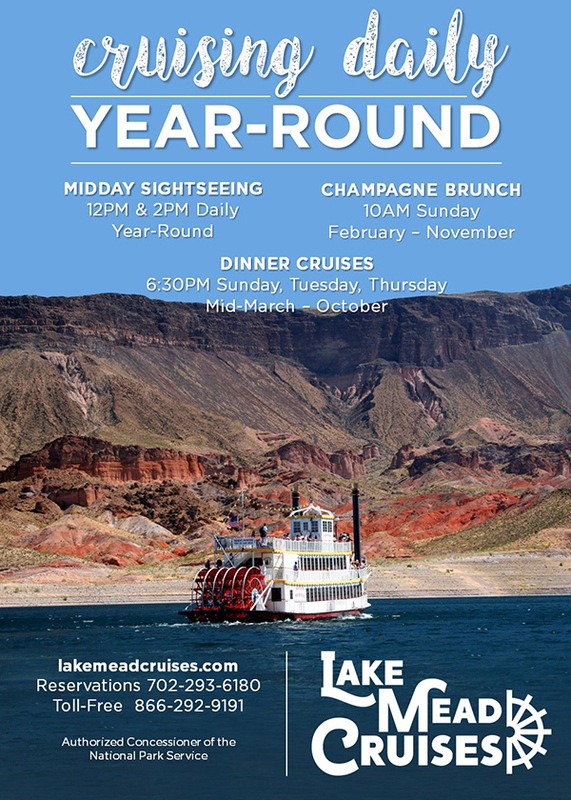 To celebrate the expanded schedule, Lake Mead Cruises is offering Boulder City Social followers 30% off any Champagne Brunch Cruise this November. (This discount applies to up to 6 adult fares per reservation and cannot be combined with any other offers.) Reservations are required. To receive the discount on your reservation, call the on-site ticketing desk at 702-293-6180 and mention Boulder City Social.